Ancra is the industry’s leading supplier of aircraft main deck cargo loading system products with its equipment in service in nearly 60% of the world’s freighter fleet - from regional jets to large widebody aircraft. The agreement includes a technology license, providing access to the technical data needed to maintain the Line Replaceable Units (LRUs) according to OEM standards and to OEM approved repairs; technical assistance, which provides training and assistance to deliver the required high quality standards; a spare parts purchase agreement, which is fundamental to offer a competitive solution based on the use of OEM approved materials. The order includes three light single and three light twin helicopters to be operated in Metropolitan France and in the Reunion Island, where SAF has recently acquired Hélilagon. Delivery of the six aircraft is planned for 2019. GA Telesis has announced completion of the previously announced share purchase by Tokyo Century Corporation and All Nippon Airways Trading Co., Ltd. (ANATC) from Global Principal Finance Company. The transaction provides the Company with shareholders that have a committed longterm growth strategy in the aviation industry. Tokyo Century and ANATC, respectively, hold a 49.2% and 10% interest in the Company. The Company is now working with its shareholders on the execution of its new engine leasing joint-venture, Gateway Engine Leasing, for launch prior to the end of the year. Tokyo Century has held an investment in GA Telesis since 2012 and elected to increase their stake to its current level. Tokyo Century has significant existing strategic investments in aviation including a 20% holding in Aviation Capital Group, the world’s premier aircraft leasing company, as well as a 16.7% interest in Jetstar Japan. Established in 1970, ANATC has evolved from a service provider of aviation serviceable parts to a multinational service and solution provider that centers its business not only around aviation but also in various fields such as food and beverages, electronics, and daily living essentials. Building on a strong customer base in Asia and other regions, ANATC strives to provide customer-centric and value-added solutions and services to its customers. MTU Maintenance, a global leader in customized solutions for aero engines, launches Technical Asset Management Services (TAMS) for asset owners. This range of services covers comprehensive technical consulting and fleet management, transitions management and housekeeping support for aircraft engines. “We are delighted to be launching TAMS, our new, intelligent and customized service, as a response to market demands and to complement our existing services,” says Martin Friis-Petersen, Managing Director MTU Maintenance Lease Services B.V. “As a MRO provider, asset manager and lessor, we are in a unique position to understand the individual requirements of operators and asset owners, mitigate risk and optimize residual value.” This includes workscoping, shop visit management, engine exchanges and assistance with engine lease returns as well as engine record reviews. “Asset owners benefit from the comprehensive engine know-how within the MTU Maintenance network paired with the expertise we have gained as an engine lessor,” Friis-Petersen adds. MTU Maintenance Lease Services’ (MLS) has a team of around 50 experts, who support over 160 transitions per year with a growing pool of engines for lease and sale. The MLS team also draws on the first class, in-house resources of MTU Maintenance, an MRO provider with nearly 40 years’ technical expertise, a worldwide network and MRO specialists on hand to perform physical inspections and in-situ repairs. TAMS is highly customized and can be integrated into further services as and when desired. Additionally, TAMS is supported by industry leading software that enables the complete digitization of documents, traceability of parts and, through a cloud-based platform, ease of access to up-to-date information for all parties involved. Bombardier Business Aircraft has reported strong order and delivery performance for the three months ending September 30, 2018. For the quarter ending September 30, 2018, Bombardier delivered 31 business jets. Third-quarter deliveries include four Learjet, 20 Challenger and seven Global aircraft, bringing the year-to-date total to 96. This strong performance represents more than 70% of Bombardier’s planned business aircraft deliveries for the year. The company further announced that its Business Aircraft segment’s backlog rose to approximately US$14.3 billion as at September 30, 2018. The company also confirmed the continued growth of its services offering and international footprint. Boeing and Adient released that their airplane seat joint venture Adient Aerospace is operational after securing regulatory approvals. The companies also appointed Alan Wittman as Chief Executive Officer and named the team that will lead Adient Aerospace in addressing the aviation industry's need for more capacity and quality in airplane seating. The joint venture between Boeing and Adient is developing a portfolio of seats for new airplane and retrofit configurations. Adient Aerospace has opened a customer service center in the Seattle, Washington area, and product development is underway in Kaiserslautern, Germany, as a continuation of work performed under an agreement the two companies signed in 2017. Adient Aerospace is initially developing lie-flat business class seating offerings for widebody airplanes. Adient Aerospace CEO Wittman was most recently the director of Business Operations for Boeing's 787 Dreamliner program. Embraer have signed a Flight Hour Pool Program agreement with Western Air, from the Bahamas, to provide repairable component support for the carrier’s fleet of ERJ-145 aircraft. 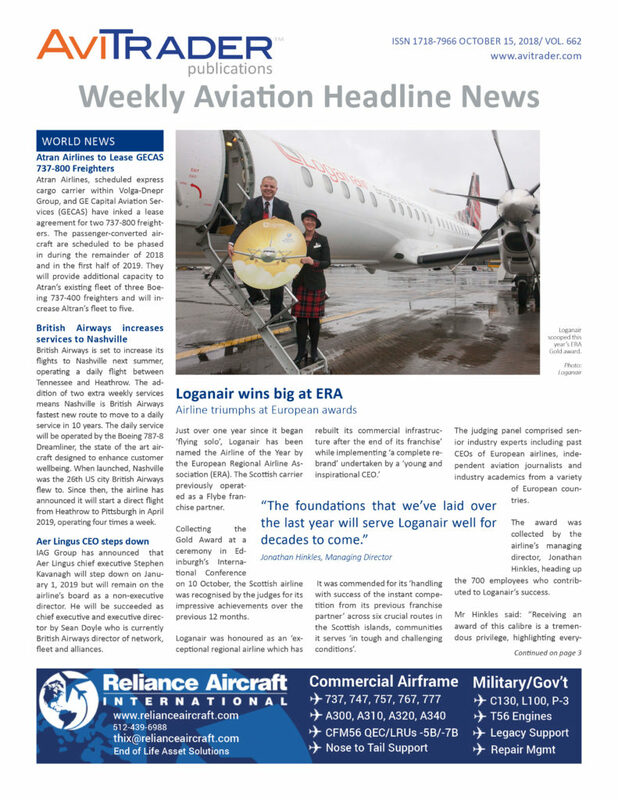 Western Air recently purchased three ERJ-145s from Embraer, becoming the first operator of the aircraft in the country, and the operator plans to purchase additional aircraft by the end of the fourth quarter of 2018. The multi-year Flight Hour Pool Program for the carrier’s fleet of Embraer jets includes material services engineering and advanced component exchanges from Embraer’s spare parts warehouse in Fort Lauderdale, Florida. Airbus Helicopters and air rescue operator Royal Dutch Touring Club ANWB, have signed a framework contract for up to six H135s with Helionix. Additionally, they have activated a first batch of three aircraft to be delivered in 2019 and 2020. ANWB Medical Air Assistance is 100% owned by Royal Dutch Touring Club ANWB and is the sole Helicopter Emergency Medical Service (HEMS) operator in the Netherlands, performing more than 8,500 missions per year, for which it is operating six helicopters of the H135 family. AviaAM Leasing, a global aviation holding company engaged in commercial aircraft acquisition, leasing, and sales, has announced the sale of two Airbus A321-211 from its fleet. The aircraft have been sold with lease attached to a global private equity investor. Since May 2018, both aircraft have been in operation, one aircraft under the largest narrow-body ACMI operator and the second one under Lithuanian airline Avion Express, with a 6-year operating lease agreement. SOAR and SABENA AEROSPACE have signed a long-term working agreement to offer Aircraft On the Ground (AOG) Heavy Recovery and Field Repair Services to the commercial aviation community. Services from these quality providers include recovery, evaluation, repair and modification in the field. SOAR provides turnkey international AOG repair services, combined with dedicated global partners via the SOAR Network™ that are routed to respond quickly to aircraft incidents. With Partner companies such as SABENA AEROSPACE, SOAR will dispatch a well qualified team 24 hours a day, 365 days a year to provide repair teams, parts, materials, project planning, engineering, full support logistics, portable hangars and much more as part of its core portfolio offerings. Component Control announced the successful “go live” status of Barfield. Barfield is a wholly owned subsidiary of Air France Industries KLM Engineering & Maintenance (AFI KLM E&M) and a leader in repair overhaul and support. Barfield has several locations including Miami, Tempe and Louisville that are now live on the Quantum Control ERP/MRO software. “We chose Quantum because of the overall product capabilities, aviation knowledge, flexibility, reliability and process support for our MRO business,” said Didier Astic, Vice President of Supply Chain & Asset Management at Barfield. StandardAero has extended its long-running relationship with aviation services provider Dumont Group through a follow-on contract for Pratt & Whitney Canada (P&WC) JT15D-5R engine overhauls. These engines will power a Hawker 400XP light jet which will shortly be entering service with the Dumont JETS division, a premier Part 135 aircraft management and charter provider. Dumont Group, headquartered in New Castle, DE, is a long-standing customer of StandardAero, having used the company for a variety of overhaul, repair, preservation and teardown services on the P&WC JT15D and PW100 engine families.